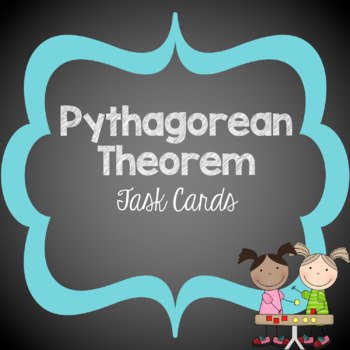 This set of 40 Task Cards will help your students practice and understand the Pythagorean Relationship and the Pythagorean Theorem. 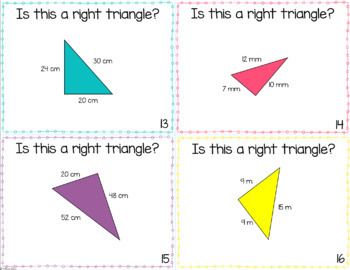 This is a great activity that can be used for math centres, group or individual practice. 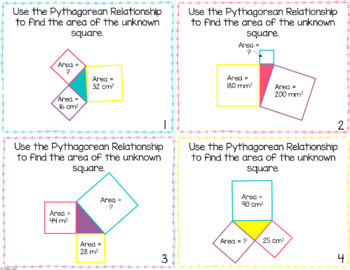 Cards 1 - 8 – Use the Pythagorean Relationship to find the unknown side. Cards 9 - 16 – Determine if it is a right triangle. 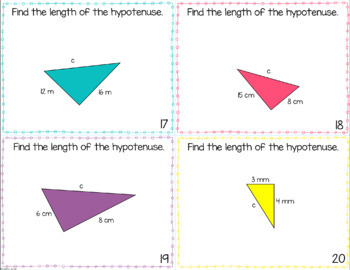 Cards 17 - 24 – Find the length of the hypotenuse. Cards 25 – 32 – Find the length of the missing leg. Cards 33 – 40 – Word Problems. Answer Recording Sheet, Answer Key and alternative American Spellings are also included.